we got another blizzard - after the one over the weekend. i've only worked 4 hours this week, as my agency keeps cancelling work due to the snow and crappy road conditions. i seriously cannot wait to get out of this apartment...i'm going stir crazy!!! daniel has been off work, too. he actually drove all the way to work monday morning - which is over an hour commute - only to find out it had been cancelled. he was a lil annoyed, but i was kinda excited because that meant he could take me to my appt! they did a follow-up ultrasound. originally they acted like i'd have to go in every 4 weeks after 20 weeks for ultrasounds to check on baby girl's growth, but she's doing great and they decided they didn't need to do another ultrasound until 32 weeks. yay! she was measuring right on track with everything, and weighed 1 lb and 6 oz. here's a pic...per usual, she didn't wanna give up a good picture, though she was kicking and waving a lot this time. emilee's bedding came in and i love it. i'm not a big fan of "themes", so we went with some bold colors/dots/circles designs. it's super cute. i can't wait to get her crib put together and finish decorating her room. daniel is doing so well with the non-smoking...he's been 7 days without a cigarette now. i hope he continues to do well with it - the chantix is working wonders. i know there's some weird side effects, but so far he hasn't experienced any of those. he said the hardest part is just not knowing what to do when he typically would've smoked. he's chewing gum like crazy. lol. i'm just so glad he's not going through withdrawals. nothing else going on - praying that the snow stays away from the mid-atlantic area for awhile!!!! ready for spring. 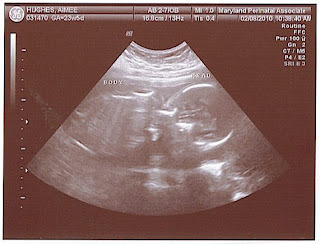 How exciting to see one of Emiliee's first pics! I could never get a good ultrasound picture of Holly either. I bet at your 32 week appointment, you will have a much better picture to show off. Are you going to do the 3-D Ultrasound? Glad all is well! :) High 5 to Daniel- that can't be easy! Hey girl. Miss your posts. Could you send me your email address? I want to email you a question if you don't mind. Lovely pic by the way. I bet you are sooo excited.